Eventually, the Union of Lublin of 1569 created a new state, the Polish–Lithuanian Commonwealth. In the federation, the Grand Duchy of Lithuania maintained its political distinctiveness and had separate government, laws, army and treasury. The federation was terminated by the passing of the Constitution of 3 May 1791, when there was supposed to be now a single country, the Commonwealth of Poland, under one monarch and one parliament. Shortly afterward, the unitary character of the state was confirmed by adopting the Reciprocal Guarantee of Two Nations. The ruins of Kaunas Castle from the mid-14th century were restored in the late 20th century, St. George the Martyr Church can be seen in the background. Mikalojus Daukša, writing in Polish, noted in his Postilla (1599) that many people, especially szlachta, preferred to speak Polish rather than Lithuanian, but spoke Polish poorly. Such were the linguistic trends in the Grand Duchy that by the political reforms of 1564–1566 parliaments local land courts, appellate courts and other State functions were recorded in Polish, and Polish became increasingly spoken across all social classes. Ruthenian and Polish languages were used as state languages of the Grand Duchy of Lithuania, besides Latin and German in diplomatic correspondence. 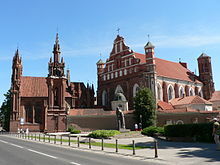 Vilnius, Trakai and Samogitia were the core voivodeships of the state, being part of Lithuania Proper, as evidenced by the privileged position of their governors in state authorities, such as the Council of Lords. Peasants in ethnic Lithuanian territories spoke exclusively Lithuanian, except transitional border regions, but the Statutes of Lithuania and other laws and documentation were written in Ruthenian, Latin and Polish. Following the royal court, there was tendency to replace Lithuanian with Polish in the ethnic Lithuanian areas, whereas Ruthenian was stronger in ethnic Belarusian and Ukrainian territories. There is Sigismund von Herberstein's note left, that there were in an ocean of Ruthenian language in this part of Europe two non-Ruthenian regions: Lithuania and Samogitia. Since the founding of the Grand Duchy of Lithuania, the higher strata of Lithuanian society from ethnic Lithuania spoke Lithuanian, although since the later 16th century gradually began using Polish, and from Ruthenia – Ruthenian language. Samogitia was exclusive through state in its economical situation – it lay near ports[clarification needed] and there were fewer people under corvee, instead of that, many simple people were money payers. [clarification needed] As a result, the stratification of the society was not as sharp as in other areas. Being more similar to a simple population the local szlachta spoke Lithuanian to a bigger extent than in the areas close to the capital Vilnius, which itself had become a center of intensive linguistic Polonization of surrounding areas since the 18th century. In the 19th century, the romantic references to the times of the Grand Duchy of Lithuania were an inspiration and a substantial part of both the Lithuanian and Belarusian national revival movements. ^ a b Baranauskas, Tomas (2000). "Lietuvos valstybės ištakos" [The Lithuanian State] (in Lithuanian). Vilnius: viduramziu.istorija.net. Retrieved 20 July 2016. ^ Sužiedėlis, Saulius. Historical dictionary of Lithuania (2nd ed.). Lanham, Md. : Scarecrow Press. p. 119. ISBN 978-0-8108-4914-3. ^ Ch. Allmand, The New Cambridge Medieval History. Cambridge, 1998, p. 731. ^ Rowell, Lithuania Ascending, p.289. ^ N. Davies. Europe: A History. Oxford, 1996, p. 392. ^ D. Stone. The Polish-Lithuanian state: 1386-1795. University of Washington Press, 2001, p. 63. ^ Statute of the Grand Duchy of Lithuania (1529), Part. 1., Art. 1.: "На первей преречоным прелатом, княжатом, паном, хоруговым, шляхтам и местом преречоных земель Великого князства Литовского, Руского, Жомойтского и иных дали есмо:..."; According to. : Pervyi ili Staryi Litovskii Statut // Vremennik Obschestva istorii i drevnostei Rossiiskih. 1854. Book 18. p. 2-106. P. 2. ^ Bojtár, Endre (1999). Foreword to the Past: A Cultural History of the Baltic People. Central European University Press. p. 179. ISBN 978-963-9116-42-9. ^ "Lithuania". Encarta. 1997. Archived from the original on 29 October 2009. Retrieved 21 September 2006. ^ A. Bumblauskas, Senosios Lietuvos istorija, 1009–1795 [The early history of Lithuania], Vilnius, 2005, p. 33. 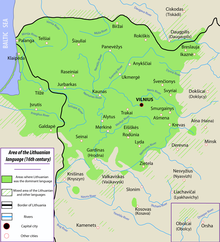 ^ By contemporary accounts, the Lithuanians called their early rulers kunigas (kunigai in plural). The word was borrowed from the German language – kuning, konig. Later on kunigas was replaced by the word kunigaikštis, used to describe to medieval Lithuanian rulers in modern Lithuanian, while kunigas today means priest. ^ a b c V. Spečiūnas. Lietuvos valdovai (XIII-XVIII a. ): Enciklopedinis žinynas. Vilnius, 2004. p. 15-78. ^ А. Кравцевич История Великого Княжества Литовского. ^ Краўцэвіч, А.К. Стварэнне Вялікага Княства Літоўскага. ^ Kiaupa, Zigmantas; Jūratė Kiaupienė; Albinas Kunevičius (2000) . "Establishment of the State". The History of Lithuania Before 1795 (English ed.). Vilnius: Lithuanian Institute of History. pp. 45–72. ISBN 9986-810-13-2. ^ Maciej Stryjkowski (1985). Kronika polska, litewska, żmódzka i wszystkiéj Rusi Macieja Stryjkowskiego. Warsaw: Wydawnictwa Artystyczne i Filmowe. p. 572. ^ Cherkas, Borys (30 December 2011). Битва на Синіх Водах. Як Україна звільнилася від Золотої Орди [Battle at Blue Waters. How Ukraine freed itself from the Golden Horde] (in Ukrainian). istpravda.com.ua. Retrieved 22 February 2016. ^ a b Makuch, Andrij. "Ukraine: History: Lithuanian and Polish rule". Encyclopædia Britannica Online. Retrieved 20 July 2016. Within the [Lithuanian] grand duchy the Ruthenian (Ukrainian and Belarusian) lands initially retained considerable autonomy. The pagan Lithuanians themselves were increasingly converting to Orthodoxy and assimilating into Ruthenian culture. The grand duchy's administrative practices and legal system drew heavily on Slavic customs, and an official Ruthenian state language (also known as Rusyn) developed over time from the language used in Rus. 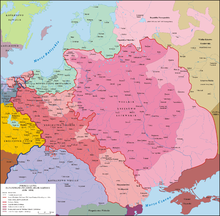 Direct Polish rule in Ukraine in the 1340s and for two centuries thereafter was limited to Galicia. There, changes in such areas as administration, law, and land tenure proceeded more rapidly than in Ukrainian territories under Lithuania. 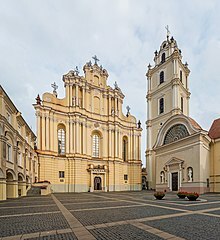 However, Lithuania itself was soon drawn into the orbit of Poland following the dynastic linkage of the two states in 1385/86 and the baptism of the Lithuanians into the Latin (Roman Catholic) church. ^ "Union of Lublin: Poland-Lithuania ". Encyclopædia Britannica Online. Retrieved 20 July 2016. Formally, Poland and Lithuania were to be distinct, equal components of the federation,[...] But Poland, which retained possession of the Lithuanian lands it had seized, had greater representation in the Diet and became the dominant partner. ^ Stranga, Aivars. "Lithuania: History: Union with Poland". Encyclopædia Britannica Online. Retrieved 12 August 2016. While Poland and Lithuania would thereafter elect a joint sovereign and have a common parliament, the basic dual state structure was retained. Each continued to be administered separately and had its own law codes and armed forces. The joint commonwealth, however, provided an impetus for cultural Polonization of the Lithuanian nobility. By the end of the 17th century it had virtually become indistinguishable from its Polish counterpart. ^ a b Marek Sobczyński. "Procesy integracyjne i dezintegracyjne na ziemiach litewskich w toku dziejów" [The process of integration and disintegration in the territories of Lithuania in the course of events] (PDF) (in Polish). Zakład Geografii Politycznej Uniwersytetu Łódzkiego. Retrieved 22 February 2016. ^ "Vilniaus barokas". vilniausbarokas.weebly.com (in Lithuanian). Retrieved 30 July 2018. ^ a b c d Burant, S. R.; Zubek, V. (1993). "Eastern Europe's Old Memories and New Realities: Resurrecting the Polish-lithuanian Union" (PDF). East European Politics & Societies. 7 (2): 370–393. doi:10.1177/0888325493007002007. ISSN 0888-3254. (Subscription required (help)). ^ a b Zinkevičius, Zigmas (1995). "Lietuvos Didžiosios kunigaikštystės kanceliarinės slavų kalbos termino nusakymo problema" (in Lithuanian). Vilnius: viduramziu.istorija.net. Retrieved 19 July 2016. ^ a b c d Wiemer, Björn (2003). "Dialect and language contacts on the territory of the Grand Duchy from the 15th century until 1939". In Kurt Braunmüller; Gisella Ferraresi. Aspects of Multilingualism in European Language History. John Benjamins Publishing. pp. 109–114. ISBN 90-272-1922-2. Retrieved 19 July 2016. ^ Stone, Daniel. The Polish-Lithuanian State, 1386-1795. Seattle: University of Washington, 2001. p. 4. ^ Eberhardt, Piotr (2003). Ethnic Groups and Population Changes in Twentieth-Century Central-Eastern Europe. M.E. Sharpe. p. 177. ISBN 978-0-7656-1833-7. Retrieved 19 July 2016. ^ a b c Dubonis, Artūras (2002). "Lietuvių kalba: poreikis ir vartojimo mastai (XV a. antra pusė - XVI a. antra pusė)" [Lithuanian language: the need for and extent of use (second half XV c. - second half XVI c.)] (in Lithuanian). viduramziu.istorija.net. Retrieved 19 July 2016. ^ Letukienė, N., Istorija, Politologija: Kurso santrauka istorijos egzaminui, 2003, p. 182; there were about 0.37 million Lithuanians of 0.7 million of a whole population by 1340 in the territory of 350 thousand km2 and 0.42 million of 1.4 million by 1375 in the territory of 700 thousand km2. Different numbers can also be found, for example: Kevin O'Connor, The History of the Baltic States, Greenwood Publishing Group, 2003, ISBN 0-313-32355-0, Google Print, p.17. Here the author estimates that there were 9 million inhabitants in the Grand Duchy of Lithuania, and 1 million of them were ethnic Lithuanians by 1387. ^ Wiemer, Björn (2003). "Dialect and language contacts on the territory of the Grand Duchy from the 15th century until 1939". In Kurt Braunmüller; Gisella Ferraresi. Aspects of Multilingualism in European Language History. John Benjamins Publishing. pp. 109, 125. ISBN 90-272-1922-2. Retrieved 12 August 2016. ^ Gil, Andrzej. "Rusini w Rzeczypospolitej Wielu Narodów i ich obecność w tradycji Wielkiego Księstwa Litewskiego – problem historyczny czy czynnik tworzący współczesność?" [Ruthenians/Rus/Rusyns in the Polish–Lithuanian Commonwealth and their presence in the tradition of the Grand Duchy of Lithuania - an historical problem or contemporary creation?] (PDF) (in Polish). Instytut Europy Środkowo-Wschodniej (Central and Eastern European Institute). Retrieved 12 August 2016. ^ Pawełko-Czajka, Barbara (2014). "The Memory of Multicultural Tradition of the Grand Duchy of Lithuania in the Thought of Vilnius Krajowcy" (PDF). International Congress of Belarusian Studies. Retrieved 12 August 2016. ^ Gałędek, Michał. "Wielkie Księstwo Litewskie w myśli politycznej Stanisława Cata-Mackiewicza" [The Grand Duchy of Lithuania in the Political Thought of Stanisław Cat-Mackiewicz] (in Polish). academia.edu. Retrieved 12 August 2016. ^ a b Diena, Kauno; Vaida Milkova (5 May 2011). "Miłosz's Anniversary in the Context of Dumb Politics". Vytautas Magnus University, Lithuania. Retrieved 12 August 2016. S. C. Rowell. Lithuania Ascending: A Pagan Empire within East-Central Europe, 1295-1345 (Cambridge Studies in Medieval Life and Thought: Fourth Series). Cambridge University Press, 2014. ISBN 978-1107658769.